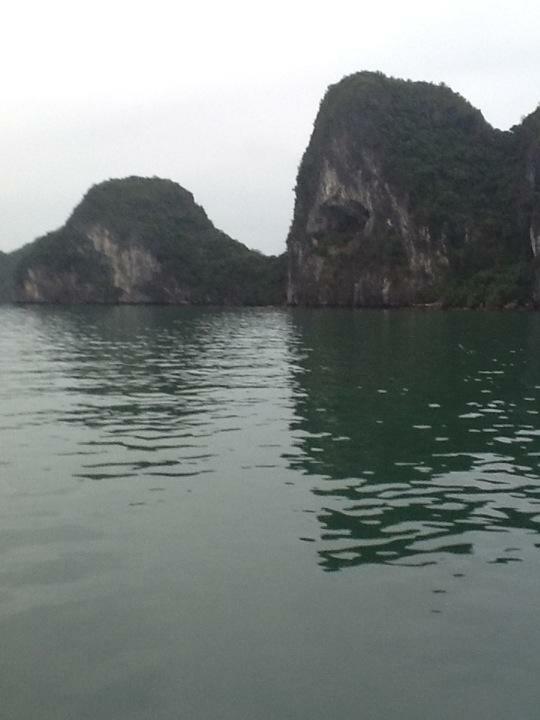 Early start for four hour drive to Ha Long Bay a classic for any geographer. Unfortunately the classic photos are always with blue skies and vibrant green - both sea and limestone islands. We had neither but this is a special place with dramatic views in all directions. The galleon we are sailing in is superb, hardwood decks and en suite cabins more than one night is really required. I'm sure this will be a mass of tourists when the season gets going so it's best to be here when it's quiet. We have two boats and a tender to flit between the two. In the afternoon is a trip to some limestone caves - same same but one of the sights then to one island with a beach but it's damp and cool. Meal on board is a buffet and afterwards we watched the top gear episode about Vietnam We enjoyed it empathising with some of the sentiments.